With the new-season trends being at the top of our wish lists, this means one thing and one thing only: It's finally time to start thinking about a winter coat. Although it's transitional weather and none of us really know what to wear right now, each year, some, if not all, key coat styles sell out relatively fast so it's time to get them now. All fashion girls know the best coats have already arrived and some have probably even sold out. To avoid such disappointment, we've done all the hard work for you and rounded up the nine trends that you need to know about. So which styles are taking off? There's something for everyone this season, from minimalist to maximalist and from old shapes in new hues to plush belted leather iterations ideal for wearing between seasons—keep scrolling to see and shop 2018's coolest coat trends. Style Notes: Animal print is set to be huge this winter. 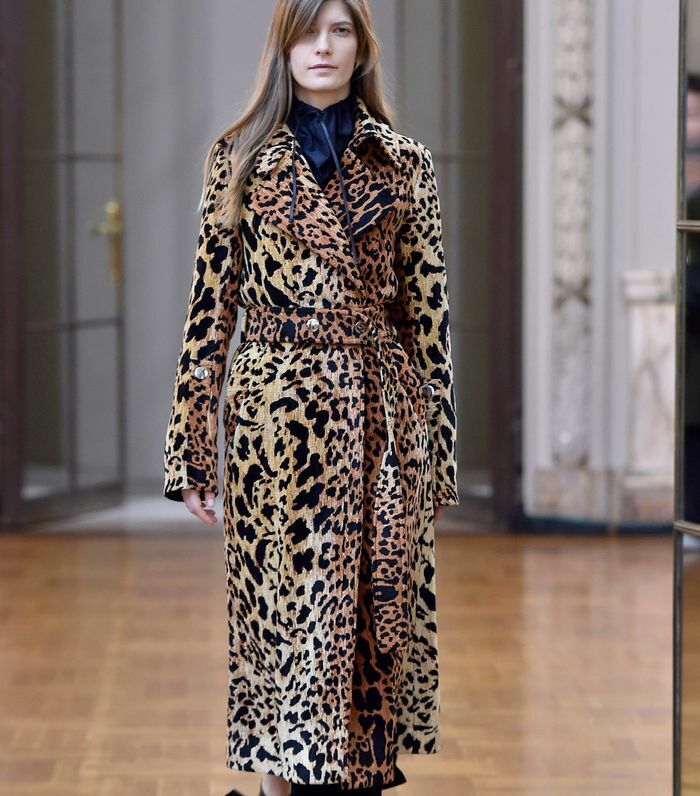 We're not just talking leopard print either, according to Victoria Beckham (you can preorder that £2495 beauty here) and Tom Ford, every print goes. Choose between zebra, python and even cheetah, or start small with leopard and slip into a faux-fur coat. Style Notes: Calling all leather fans: It's time to swap your biker for something longline and belted. Stick to muted tones and team with everything from silky dresses to fine knits, denim and even tailored workwear. Style Notes: If leather feels too retro for your tastes, Simone Rocha confirmed vinyl is here to stay. Last season it was chic black trench coats, and now, it's the unexpected shades of khaki, pink or red that are set to reign supreme. Style Notes: When a coat trend is as practical as it is fun to wear, we buy in bulk. Right now, that item is the puffer. Choose between something cropped, mid-length, belted or topped with a hood—you'll wear this on repeat. Style Notes: No surprises here, as the checked coat is still a key player and it's never looked better. Rejina Pyo's plaid iteration (below) is perfect for transitional dressing. Style Notes: You just can't beat a camel coat for versatility. Whether you choose double-breasted cuts, robe-style iterations or keep it super simple, your everyday wardrobe will thank you for this one. Style Notes: If you've already secured the perfect trench, be sure to dig it out and style it with everything in your winter wardrobe. If not, look for anything neutral and belted in oversized shapes. This is your investment purchase. Style Notes: This season's mood-lifting hue? Pastels. Pale blue is a front-runner, alongside powder pink and mint. Why the appeal? A pretty pastel shade is a perfect way to lift your autumnal wears on the greyest of days. Style Notes: Too warm for a chunky coat and too cool to go without? Try a raincoat. The practical style has ditched its reputation for being boring, and now, we're welcoming waterproof iterations in every shade imaginable. Next up, now you've got your coat it's time to choose your ankle boots.